This braided buoyant line is made out of polypropylene. That is the reason it is very lightweight and very buoyant. Even after long exposure it will not absorb water. 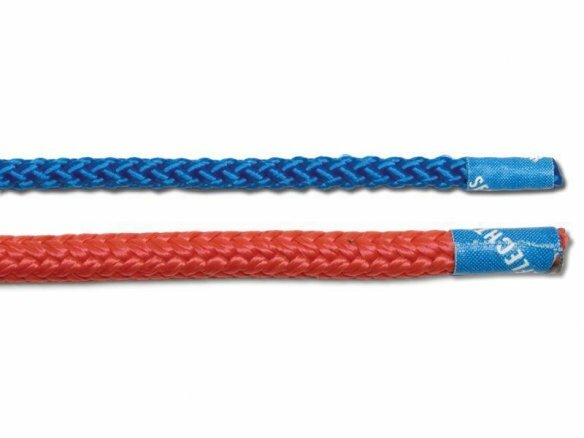 This rope has a delicate braid, which accounts for its suppleness and its good knotability. It is a very economically priced rope for really any type of use when a lightweight, monochromatic rope is required; one disadvantage, it should be noted, is that it is not really great for long-term outdoor use because the weather resistance of this type of synthetic fibre is limited to only a few years. A rule of thumb for these specifications is as follows: The bearing capacity of a rope given in kilograms is determined by combining the resistance to breaking with a security factor that is either higher or lower depending on the intended use. As a rule, it lies between 5 and 10. If you calculate using a security factor of 8, the resulting bearing capacity for a rope with a resistance to breakage of 100 deka-Newton will be 12.5 kg (100 divided by 8). This only applies to a static load and of course only to a new, undamaged rope. Please note that no exchange is possible in the case of products cut from rolls. The minimum order for products sold from rolls: 0.5 running metre.